This was a day of two churches and two towers. 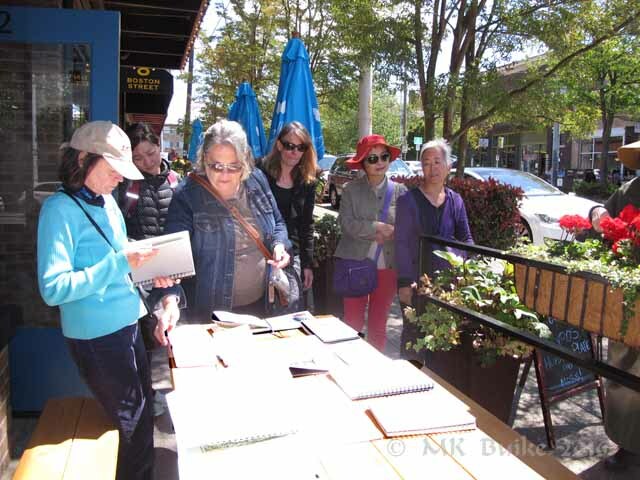 Kathleen suggested we meet for today's sketch outing on Queen Anne Ave W in the Queen Anne Hill neighborhood of Seattle. It is an ideal neighborhood... very walk-able with lots of interesting cafes, restaurants, shops and buildings to sketch. Thanks, Kathleen! As I got on the freeway at 8am, I immediately saw a warning sign: "6 mile backup due to emergency road repair". Oh, no. I'd considered taking the light rail and the bus and wished at that moment I had. But I knew my way via 1st Ave, so got off the freeway and took the surface street all the way. It took an hour, but at least I was moving. And I saw some interesting sights along the way. 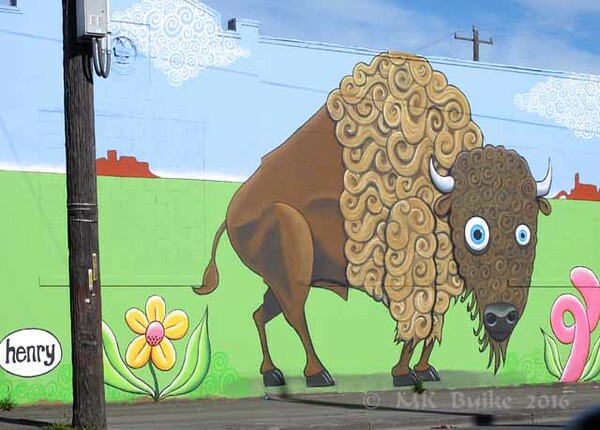 "henry" is a fairly well know muralist. Still, I arrived at 9am so was an hour early. 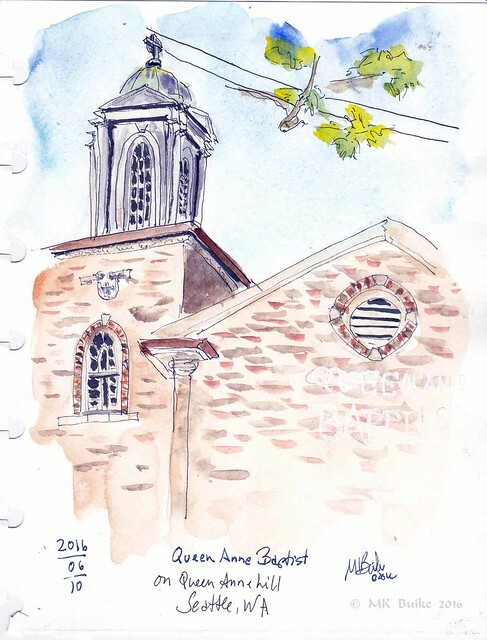 I selected the bell tower or cupola of the Baptist church as my first subject. I took a break after finishing the ink sketch to meet with the rest of the group at 10am. Then back to the same location to finish with watercolor. 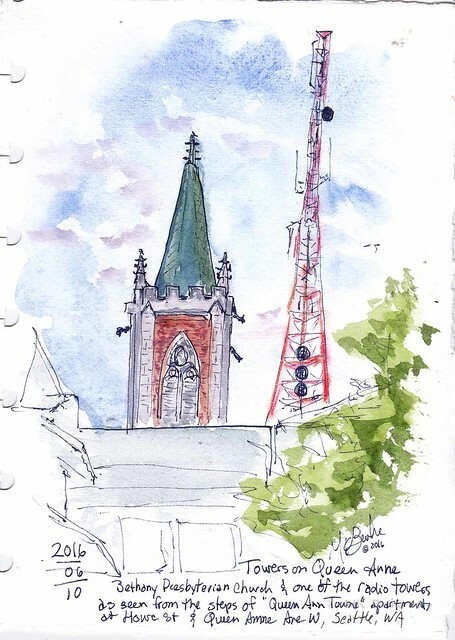 I walked down Queen Anne Ave. and saw the juxtaposition of the church steeple and the radio tower (I looked it up later and it's actually a TV tower). I wandered around until I found the perfect location from which to sketch it. Directly in the sight line was the patio of an apartment building so I climbed the steps and sat 20 feet above the street to get this view. The steeple even had gargoyles. 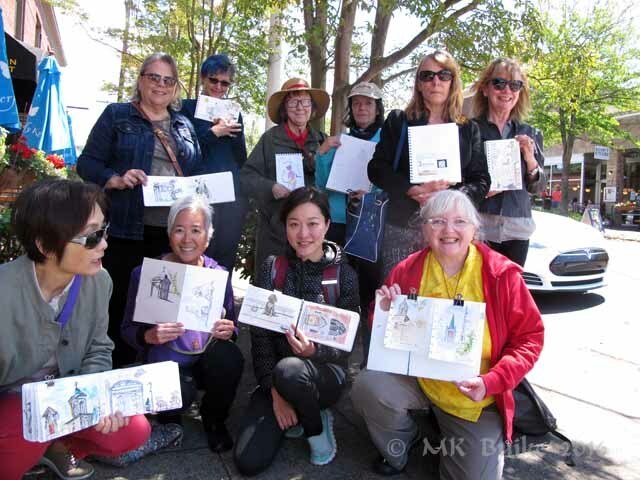 We met back to share sketches and take a group photo. 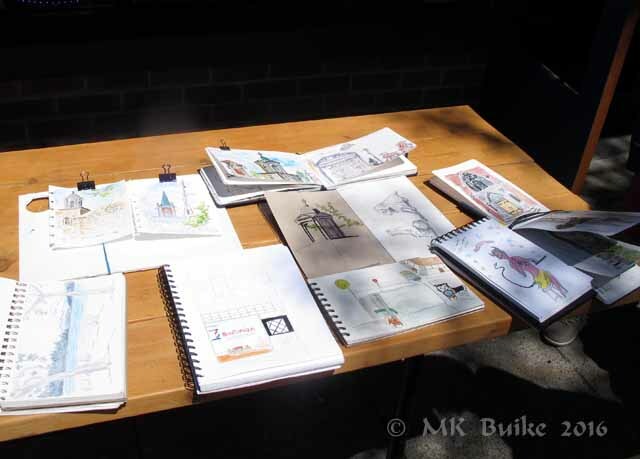 Oh, and today was my first day back with USK Seattle since mid-April! It's good to be back. Perfect, sunny 70 degree day. The rain didn't start until I was almost home and even then it only lasted a few minutes. I see a theme here in the subjects! ;-) Great to have you back, Kate -- we missed you. Nice drawings, I really like them. I was trying to learn to draw too. But I didn't know where to start, so I find a research paper helper, make a research and know, at least, I have the information basis. So I'd recommend using a similar technique to everyone who wants to start drawing from scratch.